Le Jacquard Francais - Provence Table Linens offers the promise of a pure instant of pleasure in the shade of the olive trees. This French table linen collection was inspired by the south of France, where a table can be anywhere - a balcony, a patio, the grass. The playful design of Provence combines broad stripes, ornamental motifs, and stylized flowers. 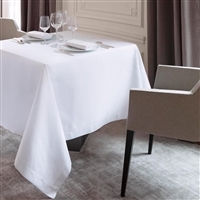 This Le Jacquard Francais Table Linen collection is available in 4 gorgeous colors.